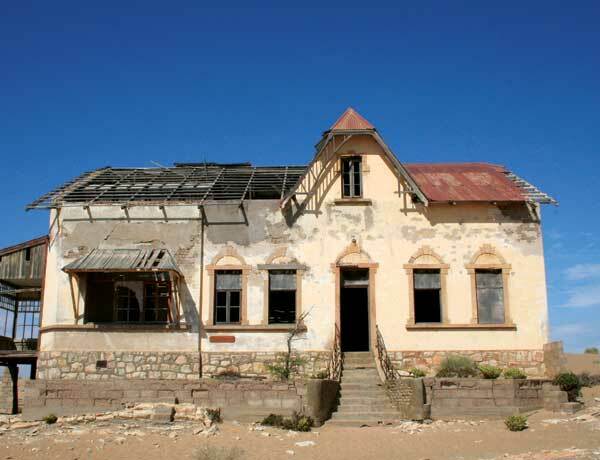 N amibia’s most famous ghost town, Kolmanskop, is situated in the Sperrgebiet National Park about 10 km inland from Lüderitz. It was named after transport driver Johnny Coleman, who lived in the tiny settlement of Aus at the turn of the century. During a fierce sandstorm he was forced to abandon his ox wagon on the small incline from where Kolmanskop can be seen. It stood there for a while, giving rise to the name Colemanshuegel, which eventually became Kolmanskop. In 1908, the railway worker Zacharias Lewala found a sparkling stone in the sand he was shovelling at Kratzplatz railway station nearby Kolmanskop. His supervisor, August Stauch, was convinced he had found a diamond. When this was confirmed, the news spread like wildfire, sparking a frantic diamond rush and causing fortune hunters to converge on Kolmanskop in droves. It soon became a bustling little centre, featuring a butchery, bakery, furniture factory, soda-water and lemonade plant, four-skittle alley, public playground and even a large salt-water swimming pool. The development of the town reached its pinnacle in the 1920s, with approximately 300 German adults, 40 of their children and 800 Owambo contract workers living there. 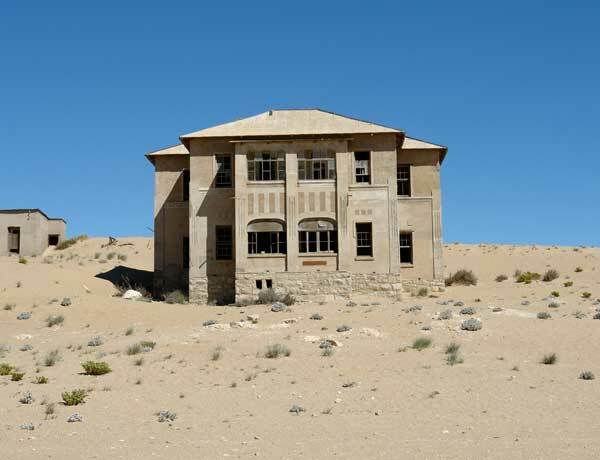 In spite of, or probably because of, the isolation and bleakness of the surrounding desert, Kolmanskop developed into a lively little haven of German culture, providing entertainment and recreation to suit the requirements of the affluent, for whom large, elegant houses were built. However, when richer diamond deposits were discovered further south, operations were moved to Oranjemund. Today, the crumbling ruins of the ghost town bear little resemblance to its former glory. The stately homes, their grandeur now scoured and demolished by desert winds, are gradually becoming enveloped by sand. In 1980 the mining company CDM (now Namdeb) restored a number of the buildings and established a museum for tourist viewing.